* If you had 2-byte characters in a table (for example, Chinese or Japanese characters), adding a bullet point would break the table. And only WWE wrestlers should be allowed to break tables. We’ve cleaned up the More Options menu (“…”) so it’s easier to find the actions you use most. As many others have written, I'm also very unhappy with the reminders hidden behind another click. In never share notes and use reminders all the time. 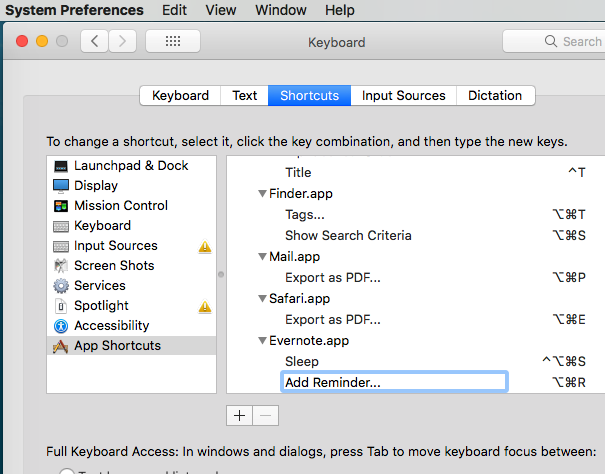 Also: As mentioned frequently in this forum: Why is there no keyboard shortcut for adding reminders? Another new interface issue in 7.5 is visible in the following screenshot. There is plenty of space right there. Why does the name of the Notebook need to be abbreviated after ONE Letter? For me 7.5. is another step backwards in usability. You made simply deleting a note a two action process by hiding it under the (“…”)!! This is the worst idea ever... I obviously am deleting notes all the time to clean up... and now you are doubling my time for this most basic function??? I am soo annoyed right now.. and i've been a paid user for almost 10 years... seriously put the delete note icon back on the note! This is an unacceptable change! I cannot believe that something as basic as the info button got moved to a bloody submenu entry (along with like four or five other button actions). I agree. @Evernote: May I suggest that you thoroughly test and get user feedback on changes to long-established UI BEFORE you publish a GA release? Just because some new kid on the Dev Team thinks it is a good idea because it follows some esoteric UI guidelines, does NOT make it so. IMO, you should NEVER change well-established UI without very good cause to do so, and without thorough end-user testing. SW development 101. I'm here to support others who are underwhelmed by the sore thumb that is the big, green, non-essential, and utterly unmoveable SHARE button that now occupies my brain every time I simply wish to write an idea. Our notes do not need call to action buttons. At the very least please provide those who prefer a simpler look the option to keep it so. ? ?? I agree with most comments here that the new Toolbar is a step back with regard to user-friendliness. Please give us back the delete and reminder buttons. Those are among the most used parts of the toolbar and have been taken away. Without even the possibility of dragging them back in from the options! As a long-term premium user I am really upset about this. Bad thinking. And also: please allow us to get rid of ugly green SHARE button in the right corner. I need the 'add reminder' returned to the toolbar. Please. I agree and I would really like to have the reminder-button back (and a shortcut for reminders). "Seriously put the delete note icon back on the note! This is an unacceptable change!" I write about design and often feel users whine too much about changes that improve hardware and software. But this is nuts. All of which require multiple steps that a single button should be able to take care of. If this were a UX improvement, I'd be all for it. But it makes an extraordinarily important function significantly more complicated. I very much appreciate good design and clean interfaces, but this is really going too far. This was a terrible idea. ATTN: @Evernote: Please show the FULL Notebook Name. I too am appalled that any UI designer would think burying things like the Delete button in a sub menu is a good idea. I NEVER share a note, why must I live with this obnoxious, useless button? Please return the UI to its previous state. It looks like they're not listening. I just got an update (Version 7.5.2) but it is still the same UI disaster. I want my Delete and Reminder buttons back! As to the share button I don't really care for it as I don't use it all that often, but then please make it a button that one can choose to have on the toolbar or not. As it is, it sticks out like a sore thumb. Re: toolbar. Why don't you guys just add the requested buttons to the menu of buttons that you can add when customising it? And if you want to have Share among those options, be my guest, I will just disregard it. But Delete and Reminder are a must. Annotation is now a 3-4 step process!!! could be one click. I don't really need the annotation summary! Not sure if anyone does (not doing legal document review in evernote)... it should be an option rather than default. Bring back the Trash note and Reminder icons. Absolutely moronic to have buried those in favor of Share. This update broke check box line spacing for me on Mac. I used to like to use evernote for to do lists, because even though they aren't nicely organized or categorized like a real task manager, at least they are flexible, they can have links to other evernote notes, and they can be organized in a hierarchy with bullets. With this update, there is inexplicable extra spacing between check box list items. See the attached screenshots, I took one on a different laptop that I hadn't updated. Note that it is not an issue for bulleted lists without check boxes. Not a life-threatening issue, but now I can't see as many tasks on the screen. Because there is no way to edit a basic thing like line spacing (gmail inbox even gives you the option to choose between 'normal' and 'compact' in list view), it's stuck this way. ? Maybe I'll make the full switch to Notion for task lists, they're very nicely formatted and give great outlining and toggle/minimization options like Onenote does, which is something that I've wished for in Evernote for about a decade. How is this a good use of space? And really, what on earth is going on over there? I follow these threads closely—too closely—and upon every release a crop of new issues always arises. Time to really consider porting out my data, especially as Evernote increases in price, yet delivers more bugs with each release. Not sure what's going on with your notebook name. I'm switching now to devel edition, to check if the problem still exists. I agree with most of the comments here. Was really disappointed to find out that one of my favorite buttons, the reminder button disappeared, and instead appeared the Share button that I have never used. 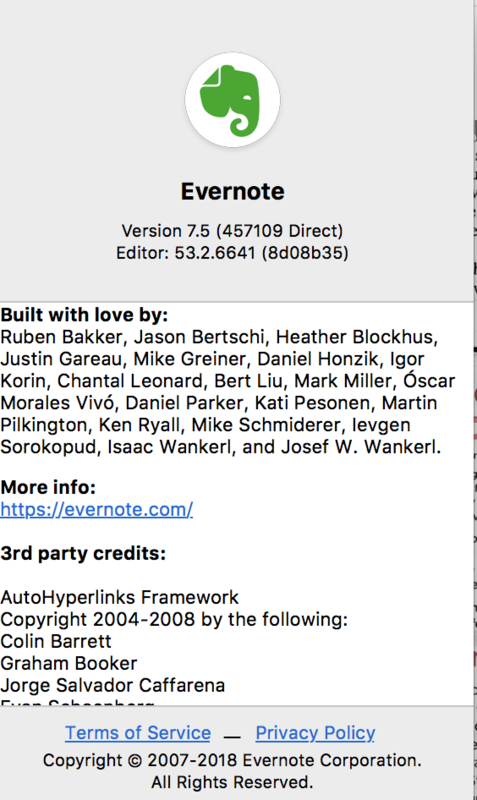 To be honest I have never used Evernote with a team, and every time a team feature is pushed unto me I get annoyed more by the nose. At least provide a way to customize the buttons on a note? Appreciate you reading these comments and addressing them in the next release. I don't see drama, just valid user feedback that the UI has taken a step backward. If you are ok with the change, good for you, but your comment and the chicken little reference tends to trivialize the feedback from others. Exactly. If people are unhappy let them vent. Pouring gas on the fire doesn't aid the discussion. Different people prefer/need different UI. some are keyboard, some are mouse, some are menus, some are buttons. What is effective for one user is NOT necessarily effective for others. Evernote has such a broad audience that it needs to provide all of the above, and let each user choose/configure the app as they prefer. I upgraded to 7.5 today, and post upgrade I am unable to paste formatted code into the code blocks. 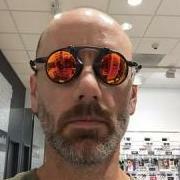 I use https://tohtml.com/python/ to highlight code which I then paste directly into the code blocks. This was working fine until today. I believe this is a bug, appreciate if you could have a look. Do you realize that you have a duplicate post? What happened to the template feature? That was probably one of the best new features you created and it is gone from the beta! I'm tempted to try to reinstall the beta just so I can have that back! I'm tempted to try to reinstall the beta just so I can have that back! If I thought this useful, I wouldn't hesitate to reinstall the beta version; I've downgraded many times. Templates will return shortly. Please keep an eye out for an update. They're now merged. Thanks for pointing it out. I'm in the same position; rarely using the Share feature. My mistake. I do have shortcut keys set up for reminders but it launches a reminders script. Count me as someone who wants scheduled (vs automatic) syncing back. Sitting here trying to make bulk changes and I can't add tags to notes because it's taking forever to sync after I add each tag... so frustrating. Maybe to some but not to me. I do agree it is a step in the wrong direction and prefer they change it back to how it was. In previous versions, the Reminder icon also served two purposes. Evernote's stated objective is to move the actions to the more (...) menu. Thanks for the feedback. We're moving this to our design team for further evaluation. In the meantime, you can efficiently delete notes by pressing ⌘ Delete on your keyboard too. Thanks, I can reproduce this and have filed a report with our development team. @nicolml, thanks for passing along the feedback from the post above. My keyboard is not allowing me to ⌘ Delete with 7.5 version. Thoughts? I can right click and it does not have, ⌘ Delete as an option. I can ri﻿ght click and it does not have, ⌘ Delete as an option. How's that look on your install? @DTLow, what am I missing? No customizations in my Apple preferences. I will open a support ticket and provide an update once resolved. Thanks! Anyone else finding 7.5 is crashing a lot? Crashed on me every couple of minutes this morning while taking notes. And then crashed again when I tried to create an Activity Log to raise a support ticket. 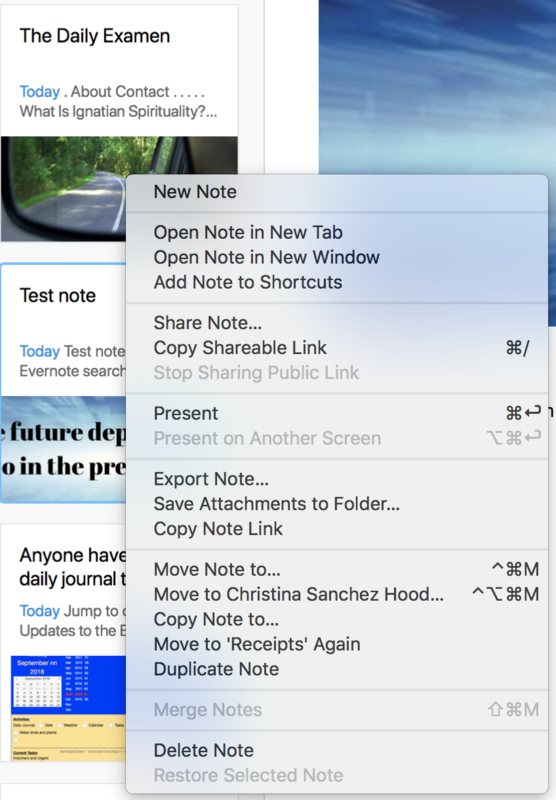 The latest version of Evernote Mac (7.5) seems to have a built-in mechanism for note templates; which is cool. I can save an existing note as a template, and upon clicking on a fresh note, I can recall the template to automatically fill the note. The problem is; the title and the tags of the debut note is not copied into the template and the new note. Although a built-in template mechanism is a good idea; the bug I mentioned makes it nearly unusable since many users (including me) use the same tags & title format on similar notes (including notes derived from a template). If this is not a bug but a missing feature, it should have a high priority; in my opinion. Thank you for the report ever_and_ever. I can reproduce this as you mention, and have filed a report with our developers. I am using Mojave 10.14 and Evernote 7.5. I have big problem : on the note list I have Black line on some title notes and it's impossible to work. This black line appear after click to open the note. All the system appear slower. Please solve the problem !!!!! Thanks for reporting. We're aware of this bug and have made the necessary fixes for a future update. Thanks! This does not work for me. I added the shortcut and it does show up in the menu. Pressing the shortcut does nothing, though. It seems like this menu never has focus, so the shortcut is sent to Evernote's general menu and not acted upon? Everything looks exactly as in your screenshots for me, but no luck. Does it work for you? I confirmed your results and will remove my posts. We’ll admit, that was taking things too far. , but we fixed that. , which was a big fail. Since updates are healthy, we put a stop to that. This was less than ideal, but on the bright side, we fixed it. , which is probably not what you expected. And notebooks deserve love too. And only WWE wrestlers should be allowed to break tables. We really like bold, but that’s taking things too far. You could say it was a big mess. That was an embarrassing oversight on our part. , but it should be smooth sailing now. Things should be back to normal now though. , but that’s no more. I have a good feeling I'm not the only one who finds this additional commentary rather irritating. I added the feature request linked below. This x100. Stop pushing us to share. Same goes for the text "You can always share later" when one creates a new notebook and selects "private" (I realize this has been there for ages but point still stands). Just stop. Try going to system preferences->accessibility->display->uncheck "reduce transparency"
One thing that I noticed on the Apple Desktop is the ability to simply switch between business and personal accounts and I greatly appreciate that functionality. Thanks, EN. do the three finger swipe up on touch pad. All of the open windows will behave normally, but Evernote's window will be super jittery and you cannot read its contents until you actually switch to it. This happens in both dark and light mode. I have sent a message one week ago regarding a big problem that I have using to use Evernote 7.5 with Mojave 10.14 regarding the list of notes that during the scrolling come black and it is very difficult to work with. you say that you know this and you would have solved in the next release. Now I see 7.5.1 and I have the same problem . I made the mistake of buying an annual premium subscription having never used Evernote before. Features aside, I use Mac to record notes 99% of the time and the evernote mac app is running so slow when you scroll and is using a lot of CPU usage in activity monitor. I have no problem using much more powerful applications on my 5k iMac. I have seen others complaining of the same issue. I have spent more time this past day or two seeing if I can get a refund, I have never come across a worse piece of 'premium' subscription based software. 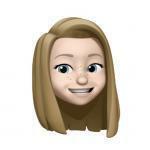 Until it improves (how that is going to happen when people have been complaining of this for months and it's not been addressed in this update), I am going back to onenote, I'll just have to accept that this week I paid for an app that is going to sit dormant for the year. Marco: go to system preferences->accessibility->display and make sure "reduce transparency" is not checked. go to system preferences->accessibility->display and make sure "reduce transparency" is not checked. Sorry, but that is NOT an acceptable solution for many of us, who MUST "reduce transparency" in order to make the screen readable, due to our less-than-perfect eyesight. ATTN: @Evernote: Please find another solution for this. Agreed; is just a temporary workaround, at best. Can we at least have the icons appear when we hover over the collapsed menu? This would reduce the need for another click. I miss the icons. They were easy to spot and click. Now I have to read a list of text to find the action I am looking for. If this was only a process that I would have to do a few times a day fine. Unfortunately, I am finding myself doing this a lot. It is slowing down routine actions/tasks. Eventually, I guess I would learn the order of the text. I believe the "hover to show icons" would be a comprise between having the icons and keeping the screen uncluttered. What is your display resolution? I'm trying to reproduce this. I reproduced the issue and filed a bug. I appreciate you taking the time to report this. Will do. Our design team is aware of the feedback at this time. Thank you! I posted the feature request linked below so users can indicate their support for a customizable header bar. Voting buttons are at the top left corner of the discussion. I had concerns with changes to the UI. I posted my feedback and also posted feature requests. >>your comment and the chicke﻿n little reference tends to trivialize the feedback from others. I think feedback is important, and Evernote has requested it. ; I'm trivializing the drama. 7.5.2 was just an update to fix a server calling issue with Templates, no UI changes. I also wanted to take the opportunity to assure you our design team is aware of everyone's feedback and they are revising each comment. Keep the feedback coming our way. Thanks y'all. 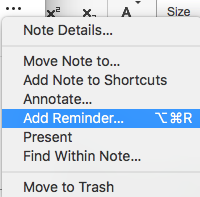 and command-option-r to launch my reminder script.